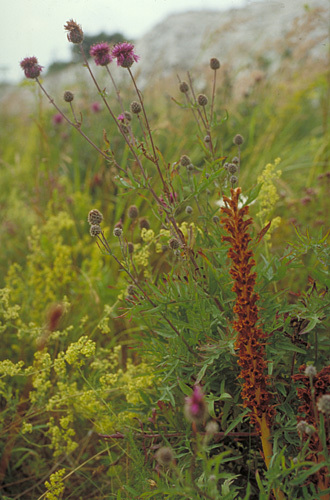 Many of the plant species from the chalky grassland in Jutland grow on the eastern danish chalky grassland too. But a few species are only found in Eastern Denmark. 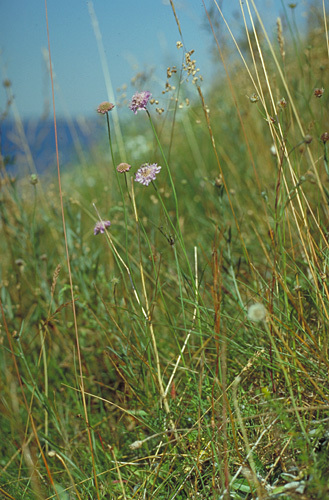 The Small Scabious (Scabiosa columbaria) is a typical plant on calcerous grassland and slopes on Seeland and Mon (right picture). It has never been found in Jutland all though it can be found as a garden escape. Otker examples of thes plants spevcies can be seen under The limestone cliffs of Mon . Knapweed Broomrape (Orobanche elatior) is a root parasite on Greater Knapweed (Centaurea scabiose). They can both be seen in the limestone quarry near Holtug. The Broomrape is very rare in Denmark and can also be found in Jutland. Back to The coast along South Eastern Seeland.